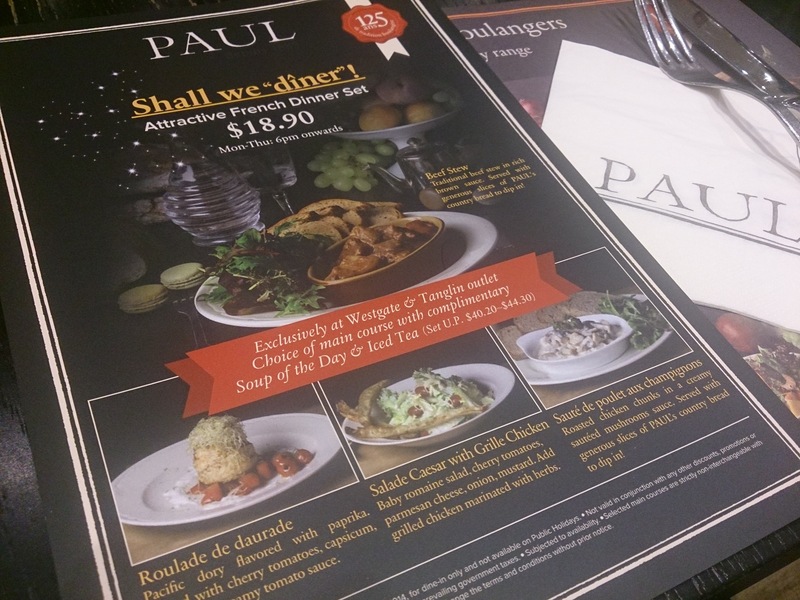 PAUL, one of the earliest French bakery-restaurant that set foot in Singapore, has just introduced executive lunch and dinner sets to their restaurants at Westgate and Tanglin Mall. 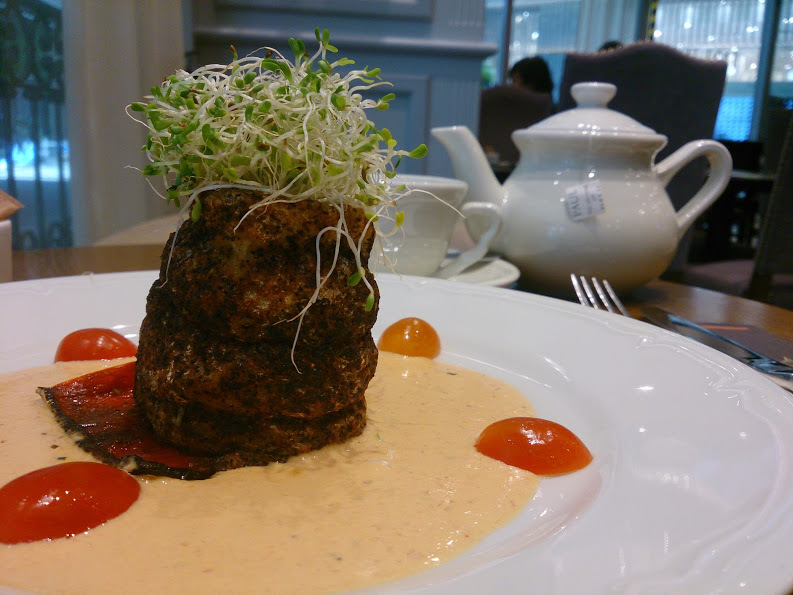 Both set menus include some of the all-time favourites from their savoury range. 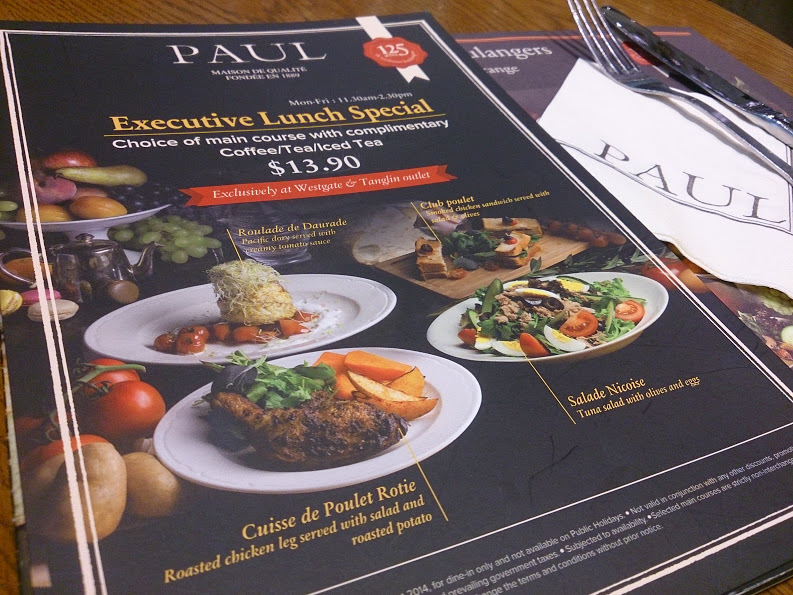 For the lunch set, diners get to enjoy their main courses with complimentary coffee, tea or ice tea for just $13.90. I get to choose from 4 dishes - Roulade de Daurade (pacific dory flavoured with paprika, served with creamy tomato sauce), the Cuisse de Poulet Rotie (roasted chicken leg served with salad and roast potato), the Salade Nicoise (tuna salad with olives and eggs), and the Club Poulet (smoked chicken sandwich served with salad and olives). I went for Roulade de Daurade. Though i'm not a fan of dory fish but I was quite intrigued by the use of paprika and creamy tomato sauce. My fish came, looking a little too dark. I assumed it was due to the paprika seasoning. Given the texture of dory fish, I expect the meat to fall apart easily. But this wasn't the case. The fish was over baked. The sides were too tough for me to slice it. I could only slice it from its middle where the meat was much more tender. It was heavily salted, without much taste of the paprika or the subtle sweetness of the fish. The saving grace was the creamy tomato sauce. It was light with a tinge of sweetness, which balanced the saltiness. I particularly like the roasted bell pepper lying at the bottom of the fish. I thought its smoky and sweet flavour complimented the fish really well. Some greens or carbs would be good to bulk up this dish. I find it too light for a meal. The executive dinner menu is more wholesome with a selection of heartier dishes - Traditional Beef Stew, Roulade de Daurade, Salade Caesar and Saute de Poulet aux Champignons (roasted chicken chunks in a creamy sautéed mushroom sauce). For $18.90, it comes with a soup of the day. I decided to go for the traditional beef stew. Carrot soup was the soup of the day. 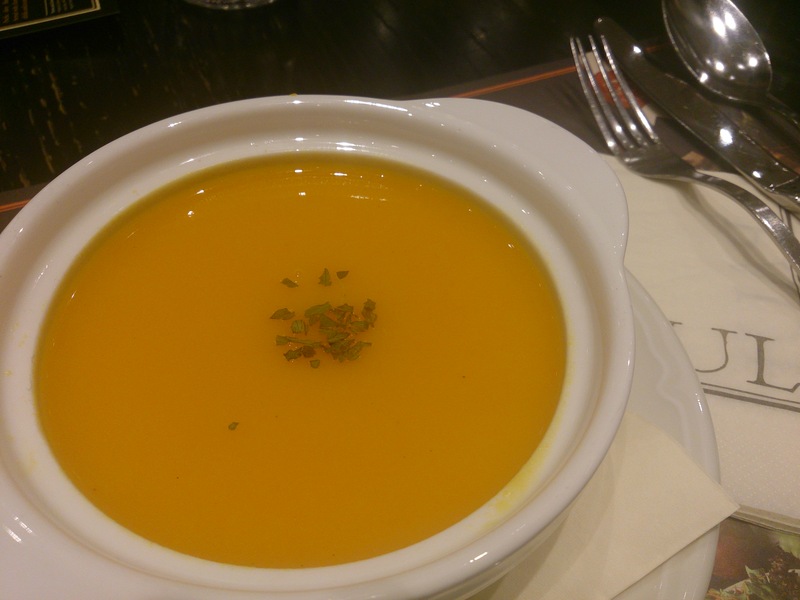 It was my first time trying a carrot soup and I love it! It was light, with the natural sweetness of the carrot. It was well pureed and not harsh to my tongue at all. My Beef Stew was served promptly. The carrots and potatoes were nicely soften but slightly too salty for me, perhaps due to the stew. 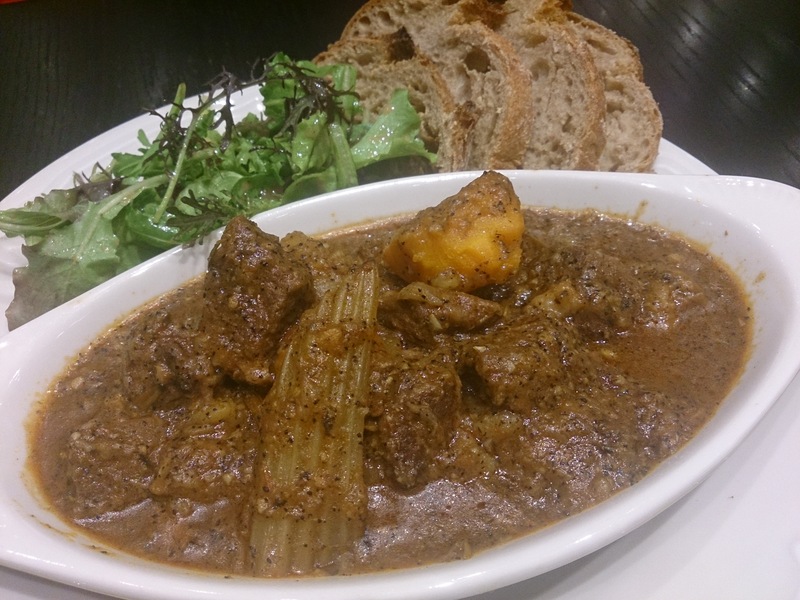 Fortunately, the beef chunks managed to retain its natural taste. Every piece was extremely tender and juicy. The bread that came along with it was a bit hard. I feel that thicker and fluffier slices of bread would be more suitable. Overall, the dinner did not disappoint me. It would have been even better if hot tea was included as one of the beverages' choices. The executive set lunch is available from 11.30am to 2.30pm, Mondays to Fridays, except on public holidays. The executive set dinner is available from 6pm onwards, Mondays to Thursdays, except on public holidays. Bon appetite!